A phrase often heard when working with people with disabilities is, "They have taught me so much more than I have taught them." Lowell and I said that just this morning, when one of our guys taught us how to open a door that is jammed shut. When I went next door today, the first thing I noticed was the door leading from the kitchen to the garage. I noticed it because there was a hole where the deadbolt used to be. My first thought was "Hmmm, that's interesting..." and I sat down to watch TVLand. (By the way, we did replace the television with a $40 deal from Goodwill). He tells me, "The door wouldn't open because the stupid deadbolt was stuck. Staff should know that this goes against my rights because I have food in the freezer in the garage and I have the right to get to my food!" He then tells me that he had to walk outside (barefoot, mind you, although I'm not sure why since I am pretty sure staff was not restricting access to his shoes as well), and open the garage door from the outside. He didn't feel like walking all the way back around, so he just "rammed the door until it opened." 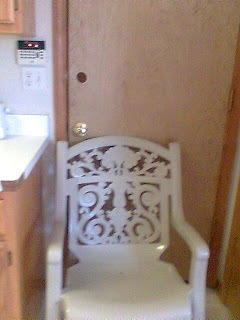 Apparently it worked, however, now the door looks like this. 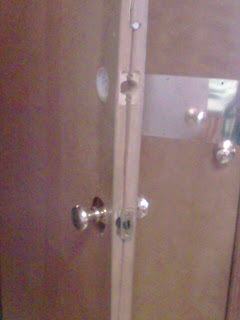 Not a great picture, but hopefully it shows the split down the middle as well as the missing deadbolt. So that's how you open a jammed door. But now how do you close it?? So now we now how to open and close a door that has been jammed shut. So much easier than asking for a little help, don' t ya' think??? ?